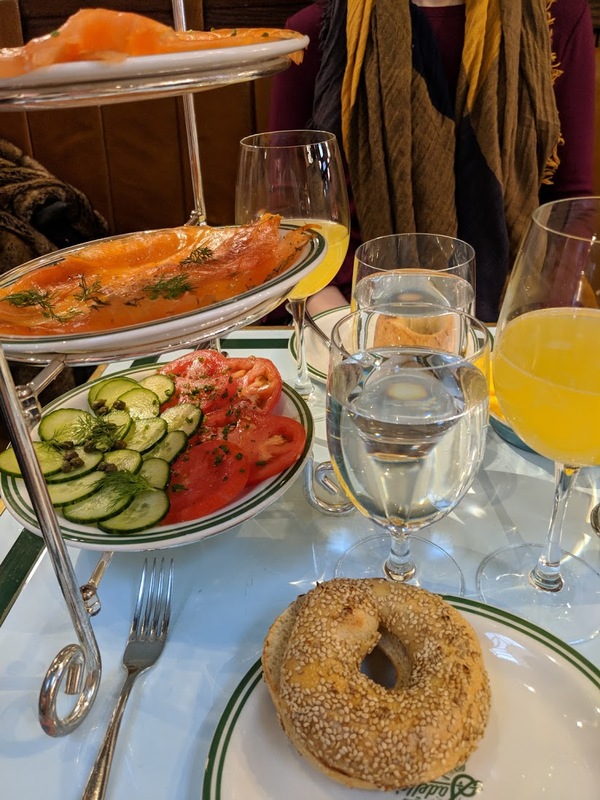 Recipient of numerous awards and accolades (and its menu offerings often associated with the word ‘best’), we just had to try out Sadelle’s for its famous bagels and smoked salmon. 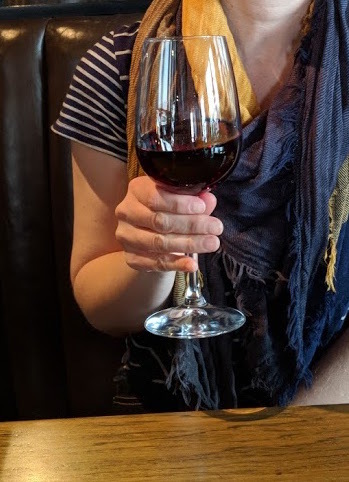 It proved to be not only a delicious Monday brunch, but an enjoyable afternoon of strolling and window shopping (even a light drizzle didn’t hamper things). 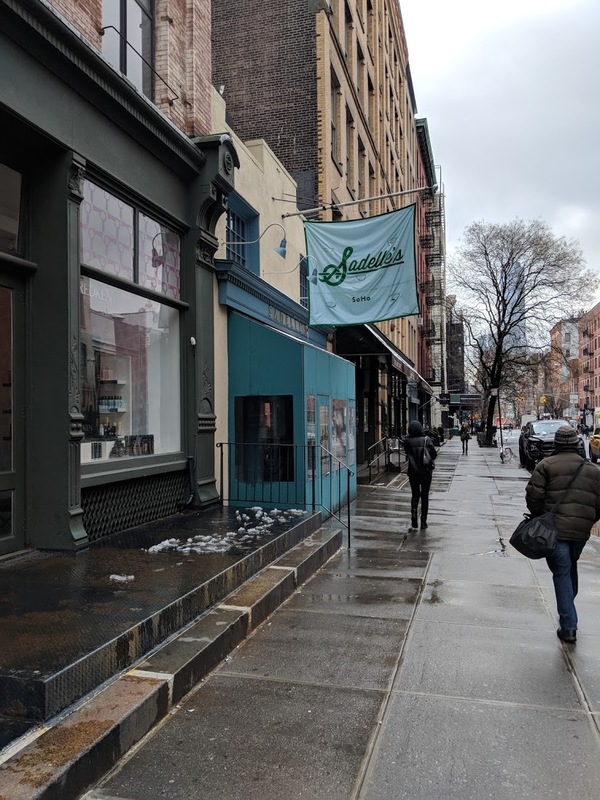 Located in Soho, Sadelle’s brought us to a beautiful New York neighborhood with upscale boutiques and galleries, but also interesting architecture and a general pleasant feeling – a nice change from the bustling Times Square where we were staying. 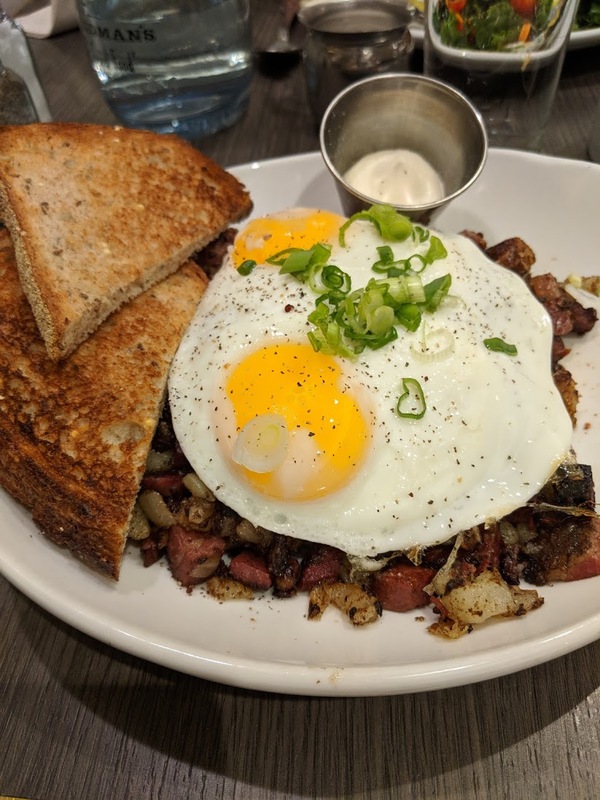 With our reservation made (highly recommended), we were seated almost immediately though the popular restaurant was buzzing with the brunch/lunch crowd. The clientele was a friendly mix of large families, couples and groups of young friends. The interior is bright, welcoming, and hip but it’s not isn’t terribly large. Our table was smallish (noticeable especially when the massive salmon platter came out! ), and the seating makes things cozy with your neighbors, but it all ‘works’ with the general atmosphere of the place. We knew exactly what we wanted and ordered right away, sampling both the house smoked salmon and Scottish salmon. I paired mine with a plain bagel and my partner had the sesame seed, both toasted and both delicious. 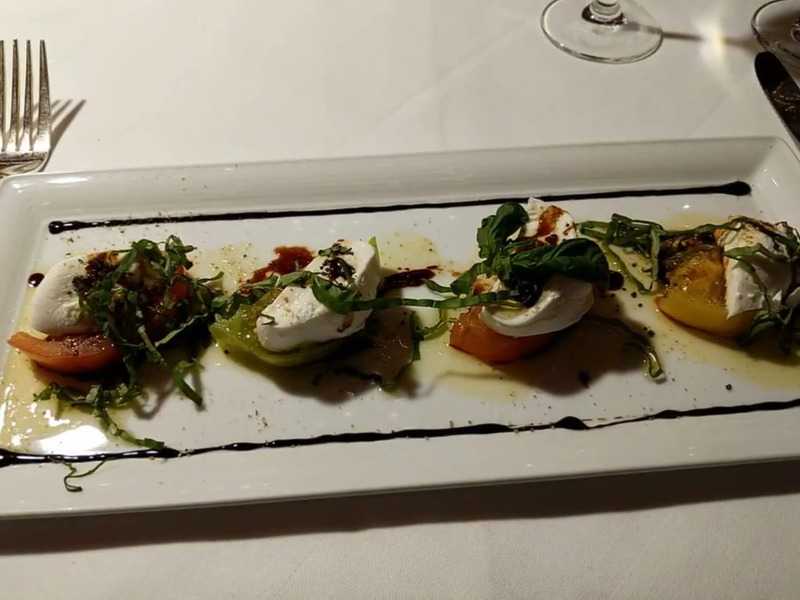 The presentation was lovely, service was friendly and fairly quick, and everything was fresh and tasty. 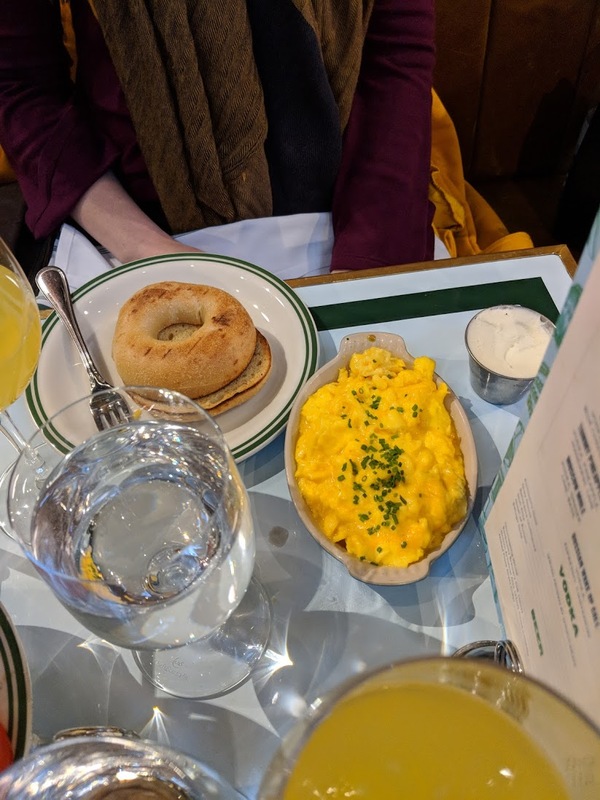 Then – and we didn’t need to do this at all as the salmon and bagels were very filling – we ordered scrambled eggs. We’d heard and read so much about them and the folks at the table next to us ordered a plate, so we had to go for it! The eggs were rich and creamy and extremely satisfying (so, you should go for it, too). 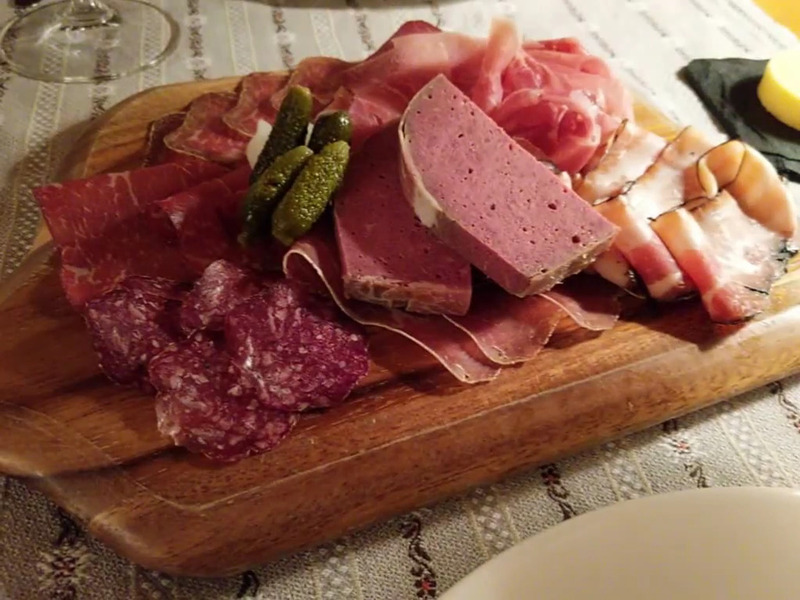 Sadelle’s deserves the various ‘bests’ you’ll hear about, so do check it out! 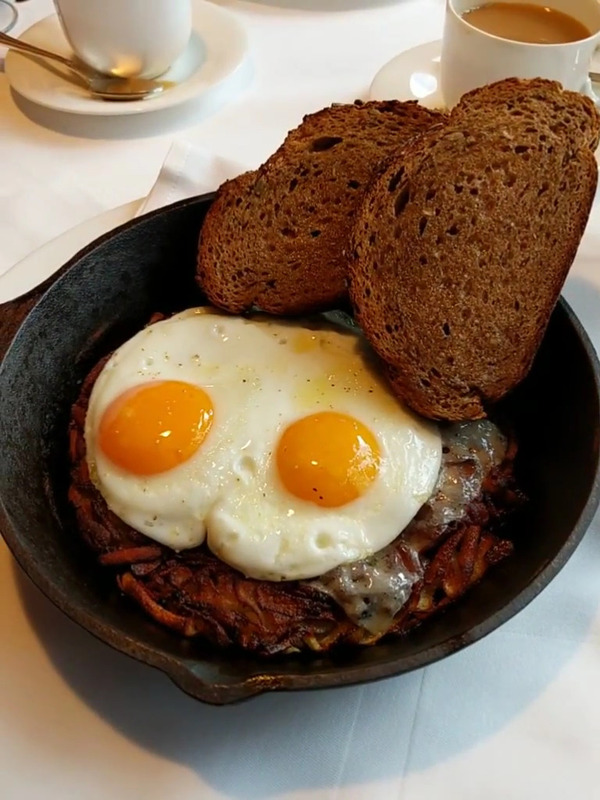 We went looking for a satisfying Saturday brunch option, and found it at Friedman’s in Times Square. 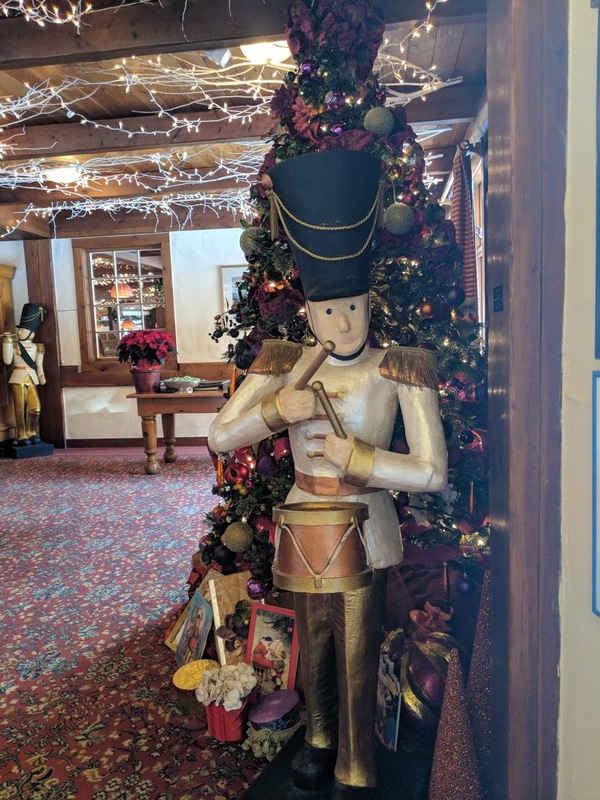 Located in the Hotel Edison, it’s a bright, cheerful, friendly place with a very diverse menu – potstickers, burgers, shwarma, classic egg breakfast, reubens, and tuna melts. 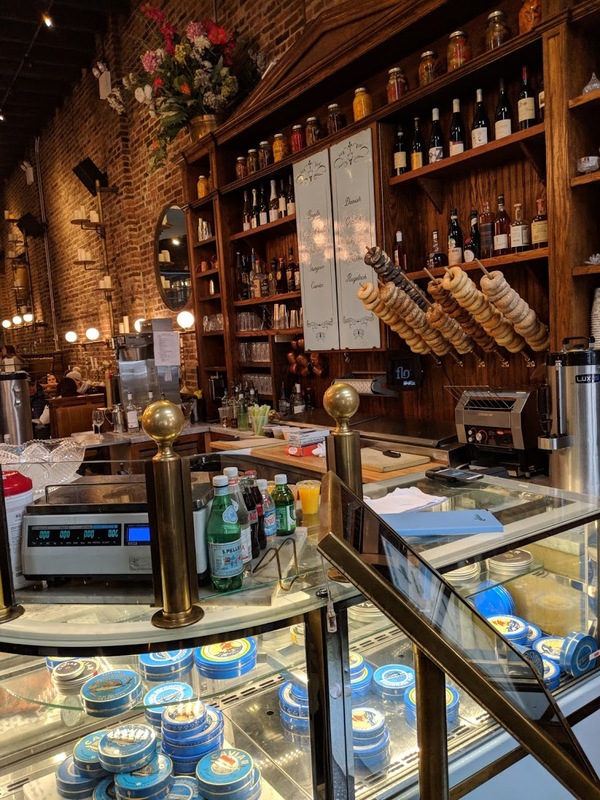 It had very good service, great coffee – and a surprisingly short wait without a reservation, at least for our party of two (around 1pm). As mentioned, there were a lot of different directions to go in in terms of meal choices. Glancing around us, everything certainly looked scrumptions and diners were enjoying with gusto. But, we were in the mood for more traditional breakfast/brunch fare. I went with the “Nova Benny” ($18), Friedman’s take on Eggs Benedict. With smoked salmon, a golden crisp potato pancake, and perfectly poached eggs it started my day right. 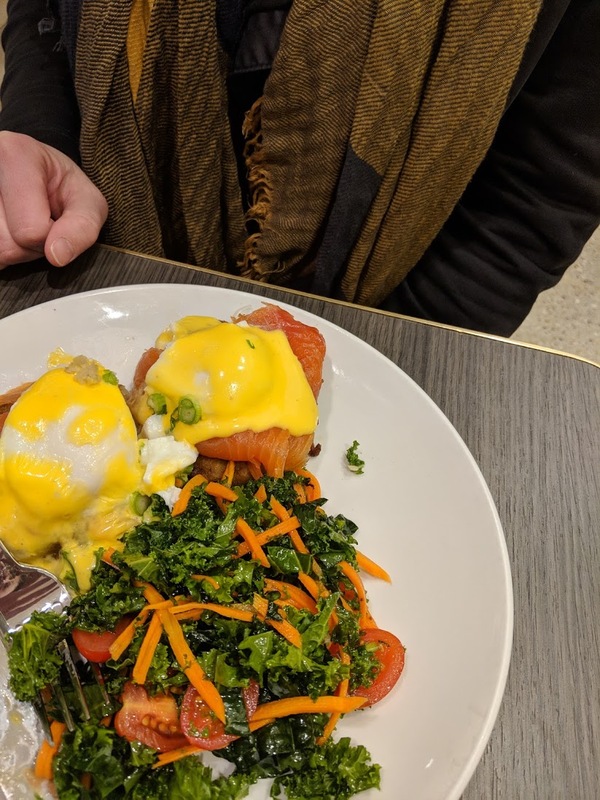 I really enjoyed the kale side salad dressed with a bright vinaigrette – it went very well with everything, and balanced out the rich Hollandaise sauce. All around a very pleasant experience and welcoming to couples, groups of friends and young families alike. 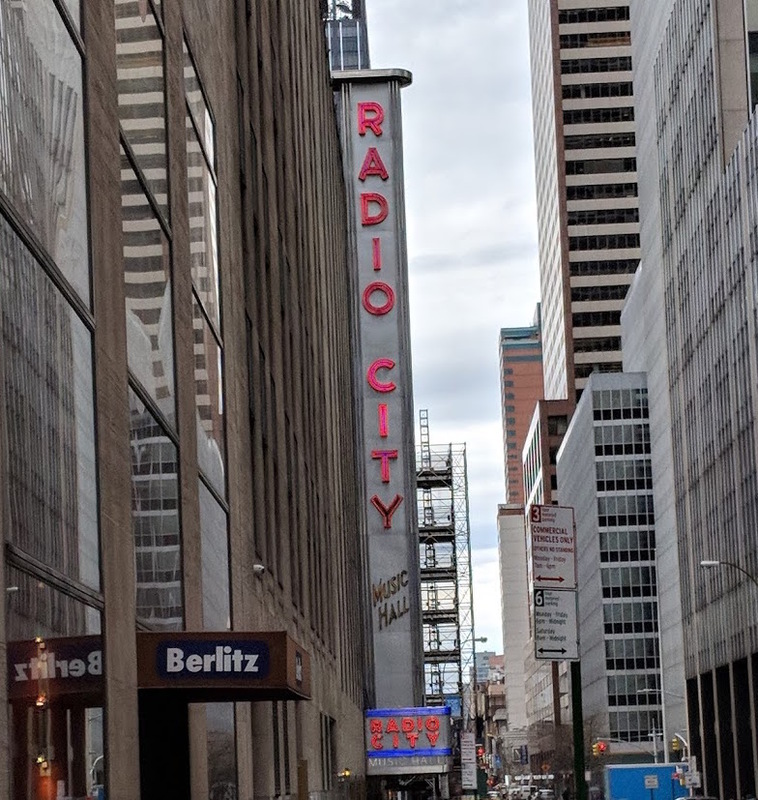 Check it out if you want to brunch in Times Square. Friedman’s is located in Times Square at 228 W 47th St, New York, NY (located in the Hotel Edison). Visit www.friedmansrestaurant.com for menu and other New York locations. We arrived in New York City for a whirlwind vacation at around 1:30pm. 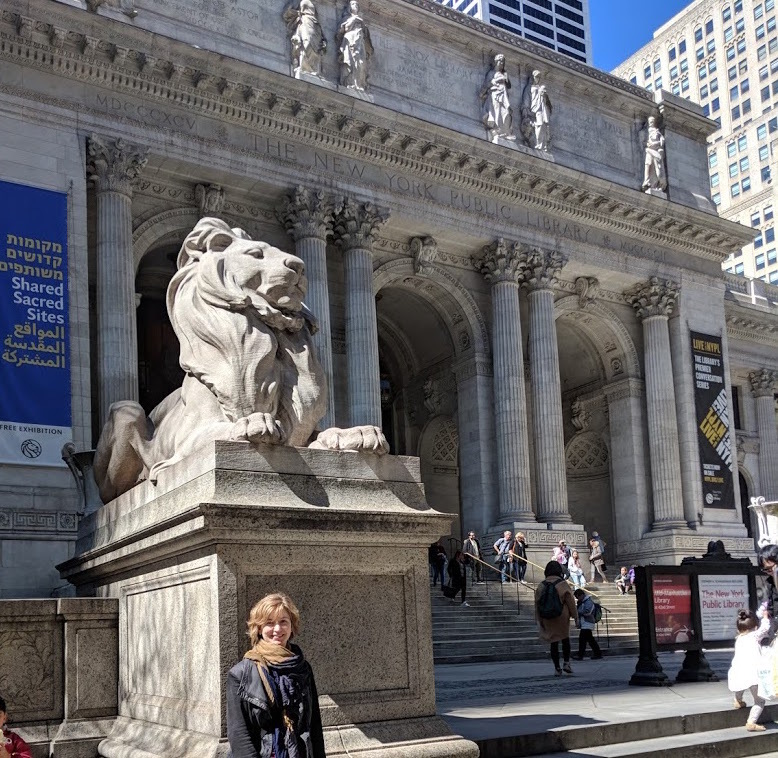 After checking in at the Kimpton Muse, we hit the streets to soak in the city and to find some lunch. 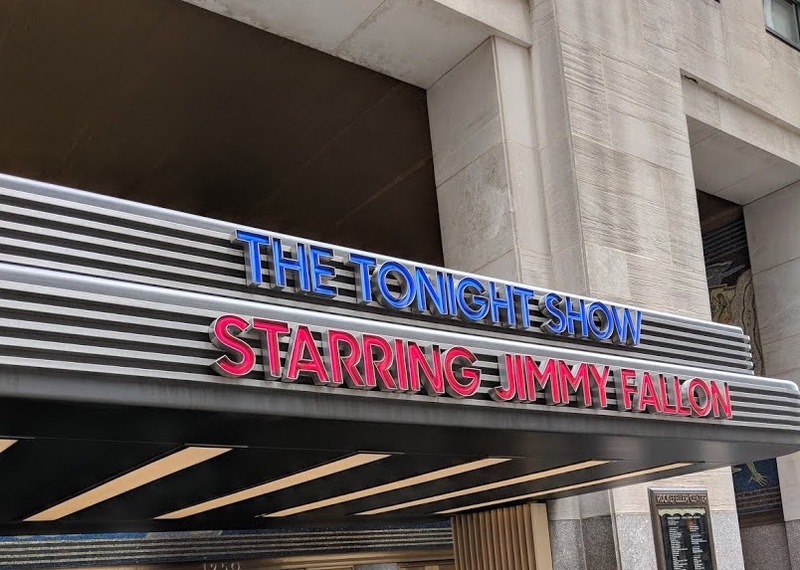 …And eventually, we arrived at one of the ultimate sites – Rockefeller Center. 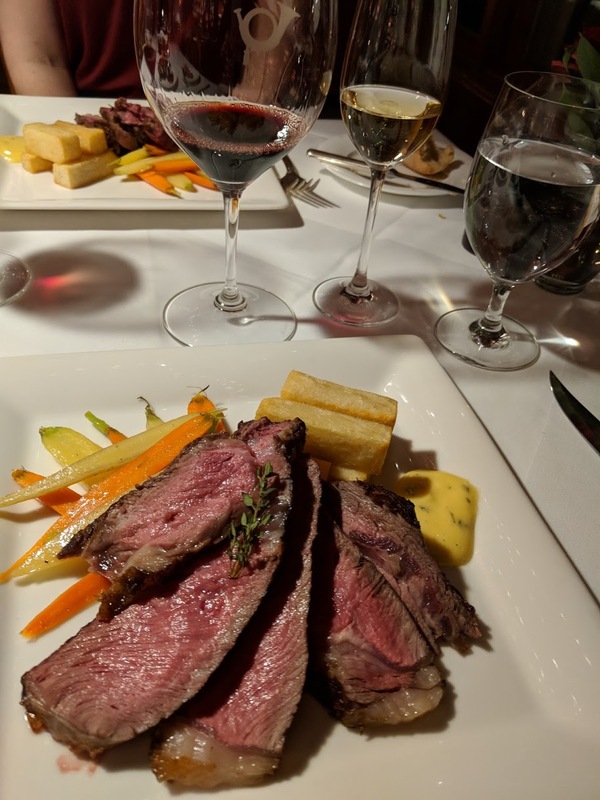 At this point, we couldn’t wait any longer to eat after travel with an early start – so we were glad to find Del Frisco’s Double Eagle Steakhouse right there. It was almost pleasant enough to eat outside on this last day of March, but we opted for an inside table. It was bustling and energetic in there, but not overly busy. Soon, we were seated, and with beverage in hand. The menu offered the classic steakhouse choices as you’d expect, from shrimp cocktail to a blue cheese lettuce wedge, and even a ‘business lunch’ section including starter and entree for $32.50. Prices are not low, but portions are fairly generous and the food was certainly good. 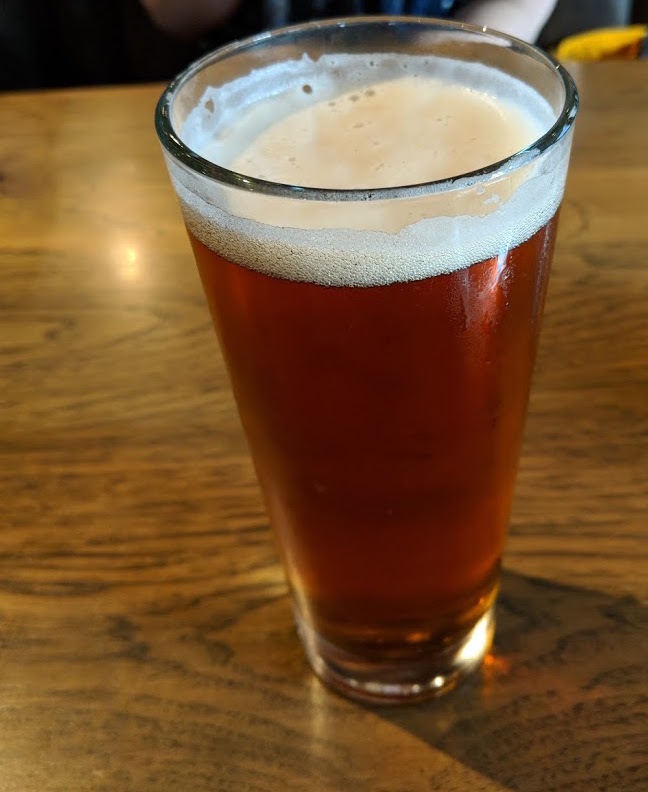 Though you could opt for a 16 oz. steak and stuffed baked potato including shaved truffle, we both went with more “lunchy” options. 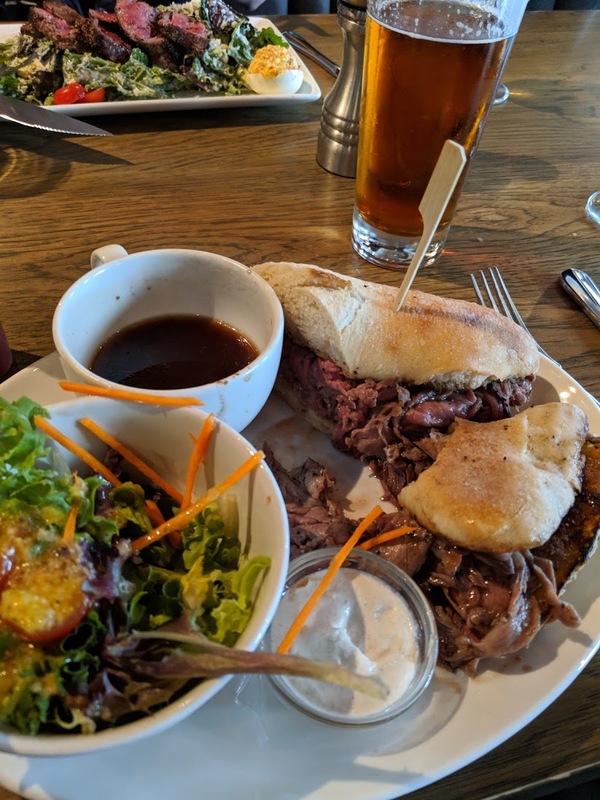 For him, the Wagyu Beef French Dip, a generous sandwich served on a crusty baguette with au jus and horseradish sauce ($23). With a choice of fries, chips, or salad he went with the side-salad to freshen things up. Washed down with a beer, lunch was good. I chose the Prime Steak Salad (and somehow neglected to take a picture to show it off, although you can see it if you look carefully in the background of the Wagyu French Dip shot). 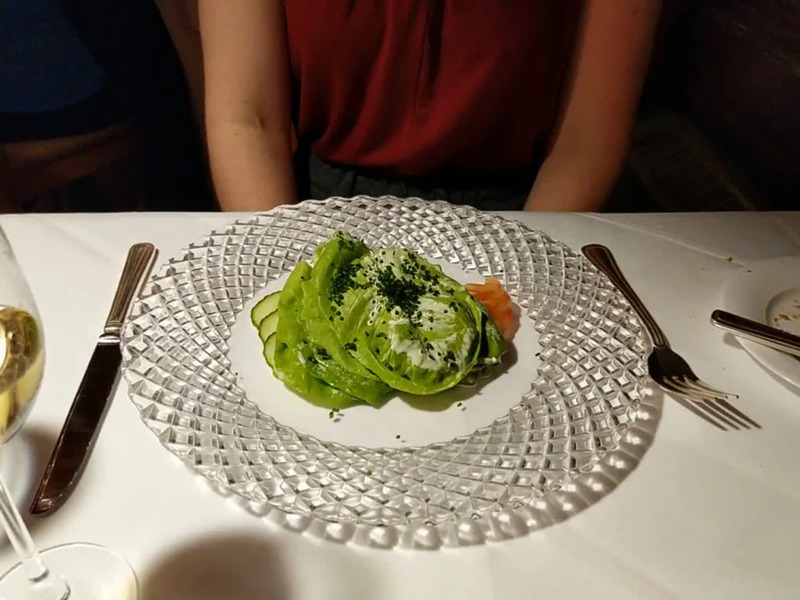 It was very yummy and rich with its blue cheese crumbles and avocado, and a really zippy horseradish dressing ($25 – generous portion and satisfying). All in all, a nice find for an upscale, relaxing lunch. Daniel Boulud’s Boulud Sud (NYC) is a restaurant located in New York City’s Upper West Side. 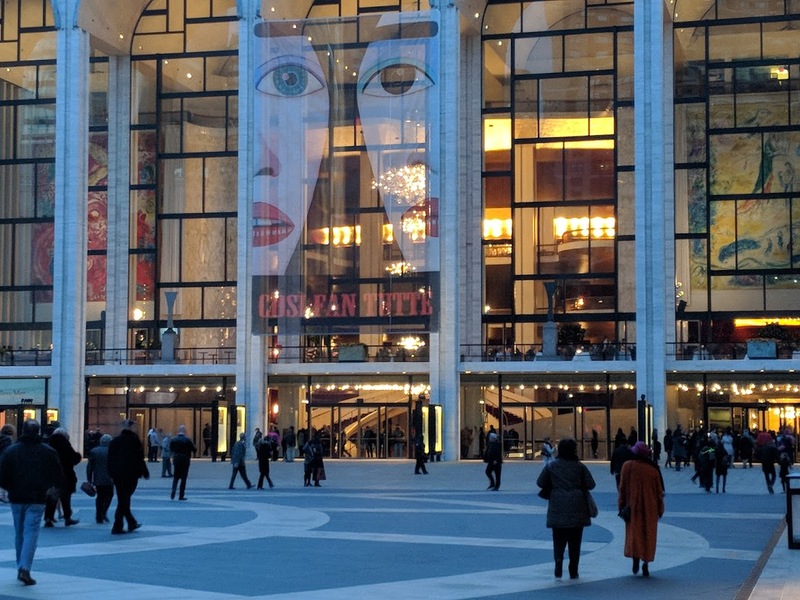 It’s an easy five minute stroll from Lincoln Center where we were attending the opera (Turandot) later that evening. The show began at 8:45 pm, so we booked a very early dinner (5:45) in order to linger and savor as much as we wanted, and still arrive early at the Met to do a bit of exploring. Immediately upon our arrival we were asked if we were heading to a show (as most people in the restaurant at that time likely were doing). Though we had ample time, we appreciated the consideration and the excellent servers paced everything wonderfully. Champagne to start the evening – our first official full day and night in New York. 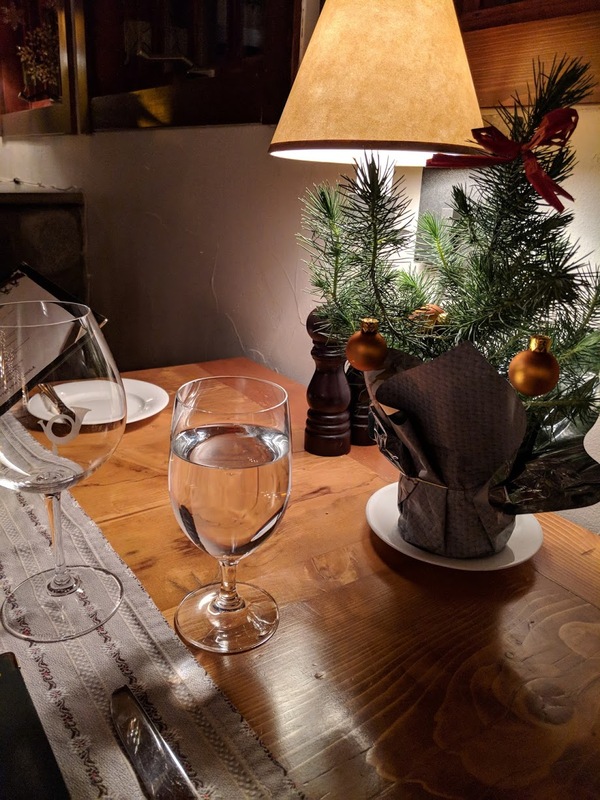 As we sipped, we drank in the lively atmosphere of the busy dining room. The open kitchen added to the dynamic feeling, but overall the the room had a comfortable, relaxed, elegant character. 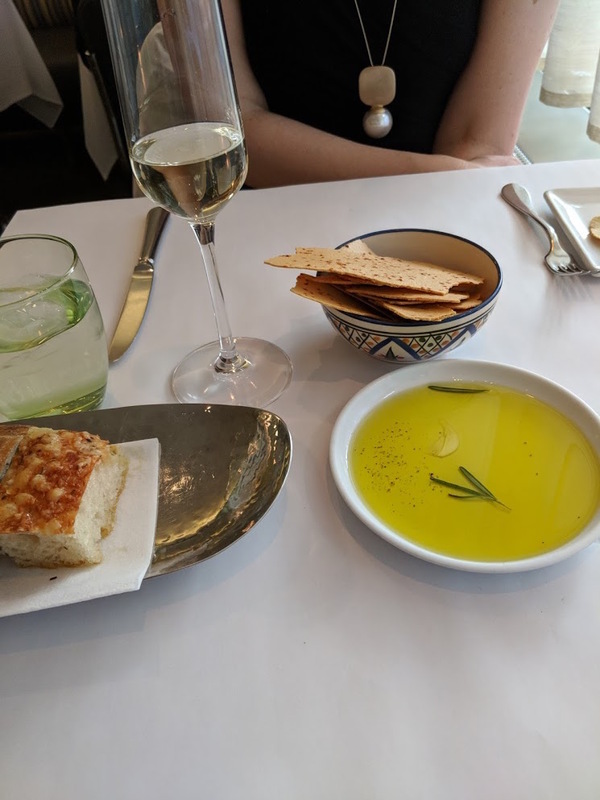 Our server soon brought out warm homemade foccacia bread and crisp chickpea crackers with a fruity olive oil for dipping. The chickpea crackers were brought out to accommodate my nut allergy – but they were delicious and addictive in their own right. 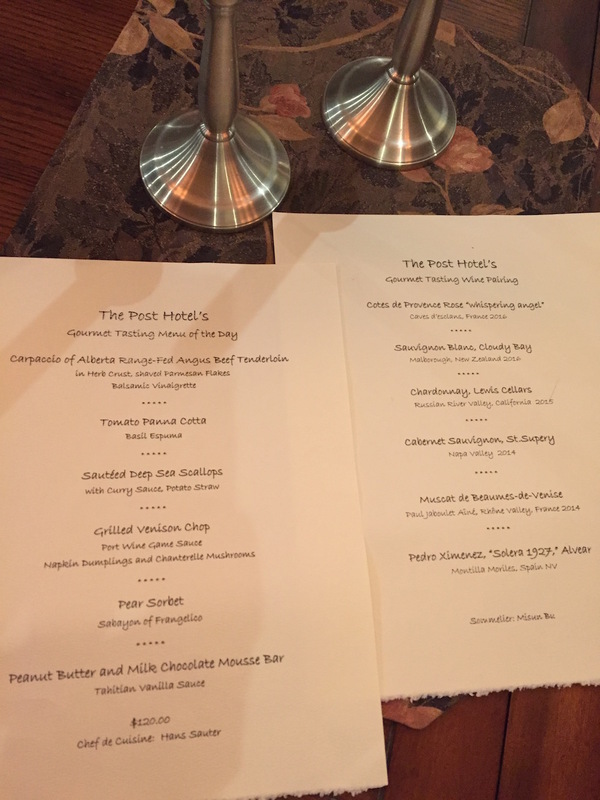 (Excellent attention was paid to my dietary needs for every course – our server had intimate knowledge of every dish. Because of this, she was also able to steer us toward delicious options). The menu was colourful, promising fresh, interesting ingredients. There were many intriguing choices, so we decided to go in different directions for every course in order to try as much as possible. 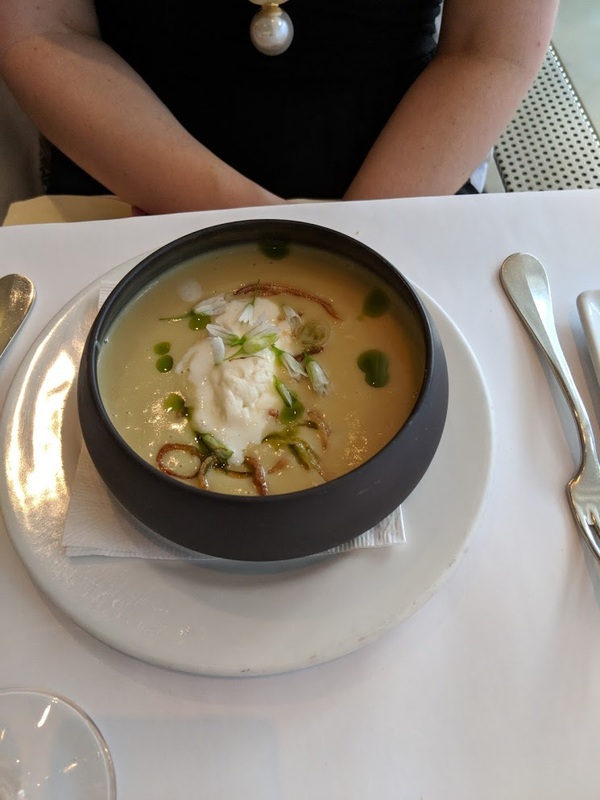 To start, I had the Spring Onion and Potato Soup with Whipped Goat Cheese and Dill Oil. Ohhh….this was creamy and dreamy, fresh and delicious. 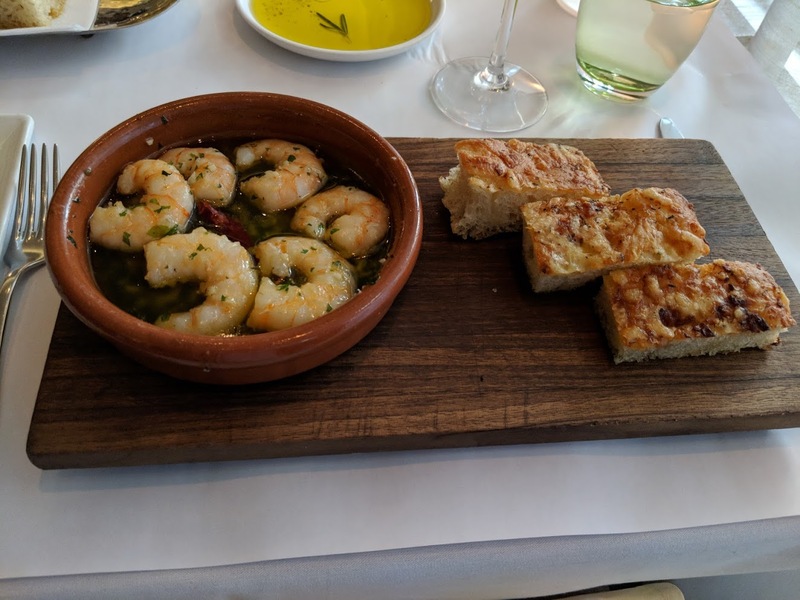 For him – Gambas Al Ajillo, shrimp with red chili and foccacia bread. The verdict here was that it was pleasant but nothing to blow us away – my soup was better. Our least favourite dish of the night. 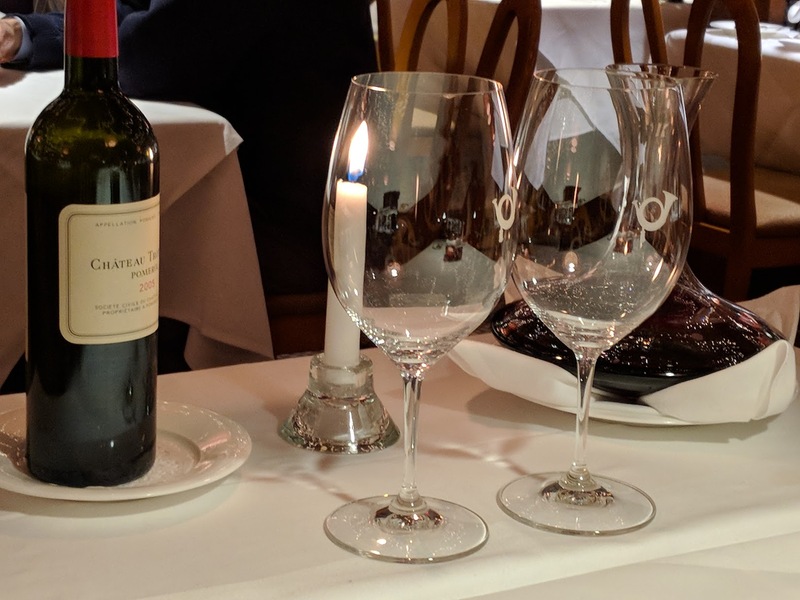 Moving on to the main course – there were non-fish options to be sure, (Chicken tagine, wagyu beef dish) but the Sea Bass and Daurade caught our eye. Our server nudged us further in this direction. suggesting these were the best items on the menu. I absolutely loved the Seared Mediterranean Sea Bass. 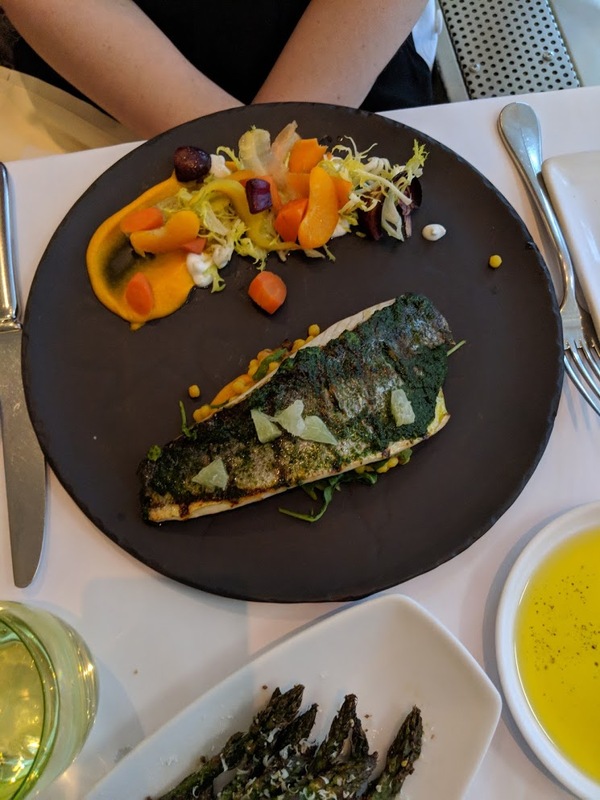 Not only was the fish itself perfect, the accompaniments were so bright and interesting – heirloom carrots, clementines, and a saffron fregola sarda (Sardinian semlonina pasta – like a large couscous). There was a lightness about the dish, too (every dish, really), leaving me full but not weighed down in any way. 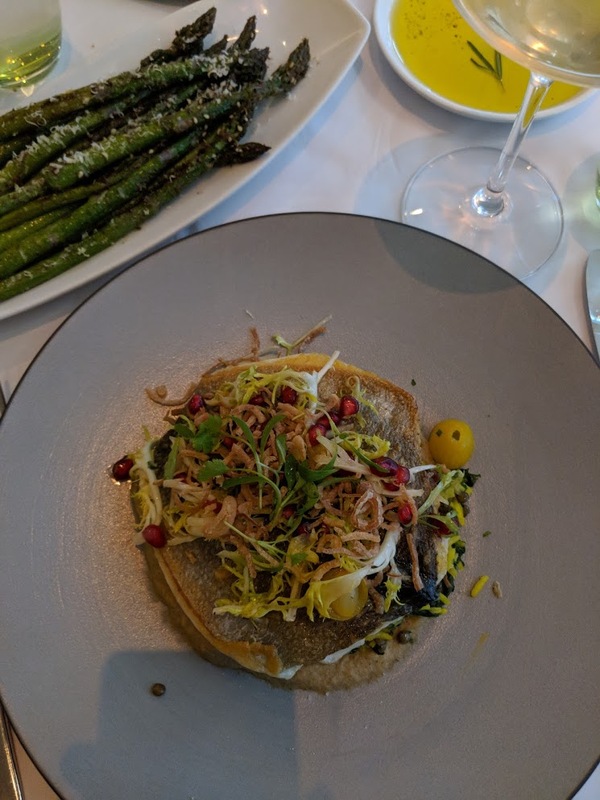 The Daurade a la Plancha served with Mejadra (a lentils and rice dish), eggplant tahini and pomegranates was gorgeous to look at as well as tasty. I hope it’s obvious from the photos, but the presentation all around was quite lovely. 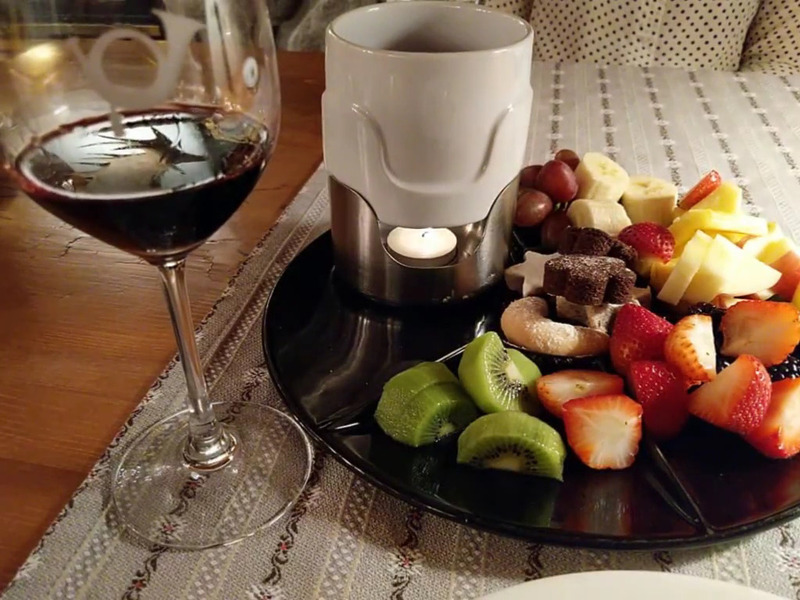 Now, I enjoy sweet things but I much prefer to spend my appetite on the more savory courses of a given meal, sometimes even skipping dessert entirely. I’m so glad I didn’t miss out this time! 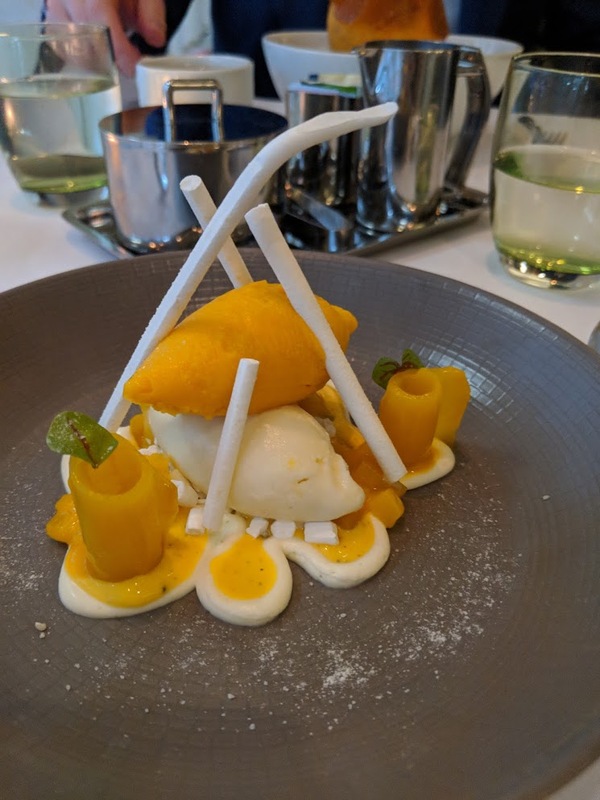 This dessert was truly one of the best I’ve ever had: Mango and Cardamom Vacherin with yogurt (almost ‘meringued’ into sticks with a pleasant bite to them). I can still taste this unexpected dish now: it was an awesome mix of creamy, sweet, spicy (the cardamom!) and juicy-fresh from the mango. 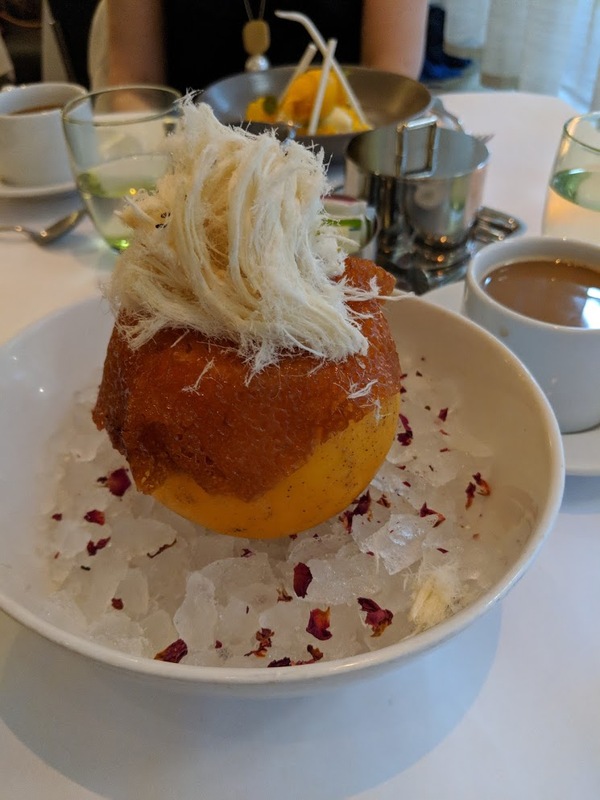 I wasn’t sure how the vacherin was going to figure in to all this, but what it did was add a slightly savory, tangy yet rich tone – like the exquisite taste you get with a bite of a great cheesecake. I don’t know where or when I’m getting anything like that again. And it was a work of art on the plate! 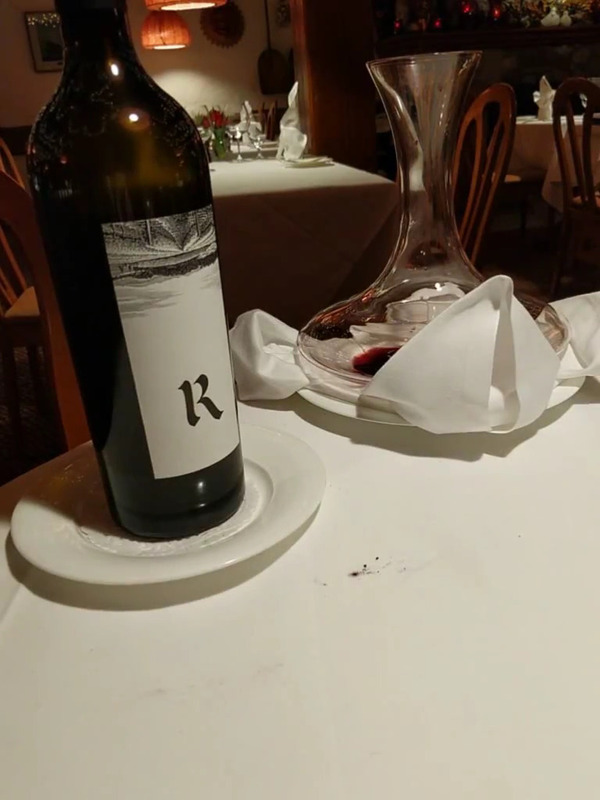 I of course must mention the interesting wine we selected with the help of our server (appreciated!). Making a choice with all the unique flavours and ingredients we knew were on the way was not easy, and we were glad for the help. We ended up sharing a beautiful bottle of French Chardonnay (Michel Gahier, “Les Follasses” 2015) from the Jura region in the east of France. 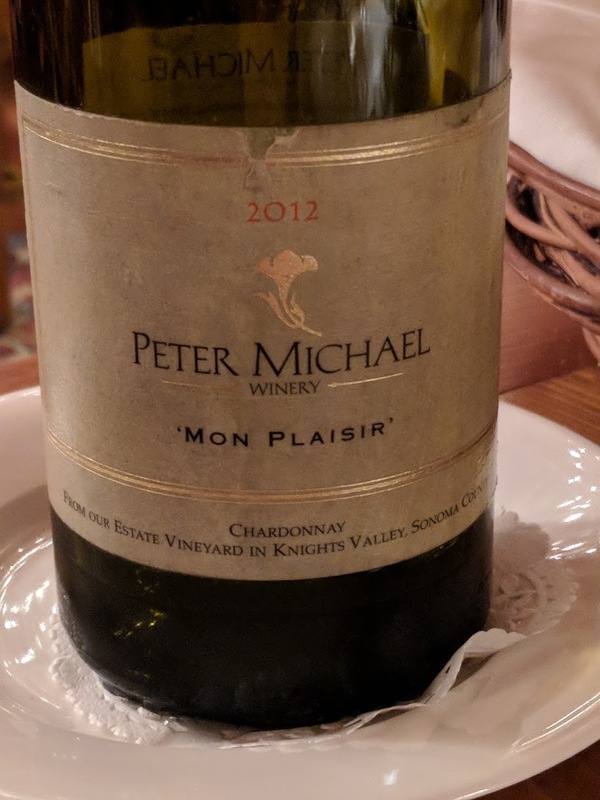 It looked and tasted somewhat like a cider with that same sort of dryness – very different in terms of the Chardonnays we know. 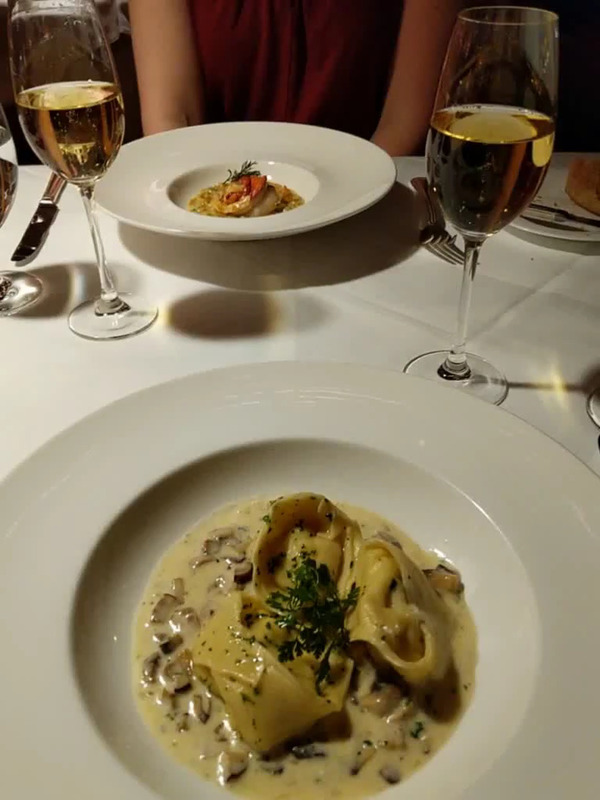 But we found it paired well with every course which was characterized by such a variety of flavours and textures. Boulud Sud is located at 20 West 46th Street in New York City’s Upper West Side. Visit the website to make reservations, or go to www.opentable.com.